**** As some of you may already know it's Women In Horror Month's 9th Annual Celebration. 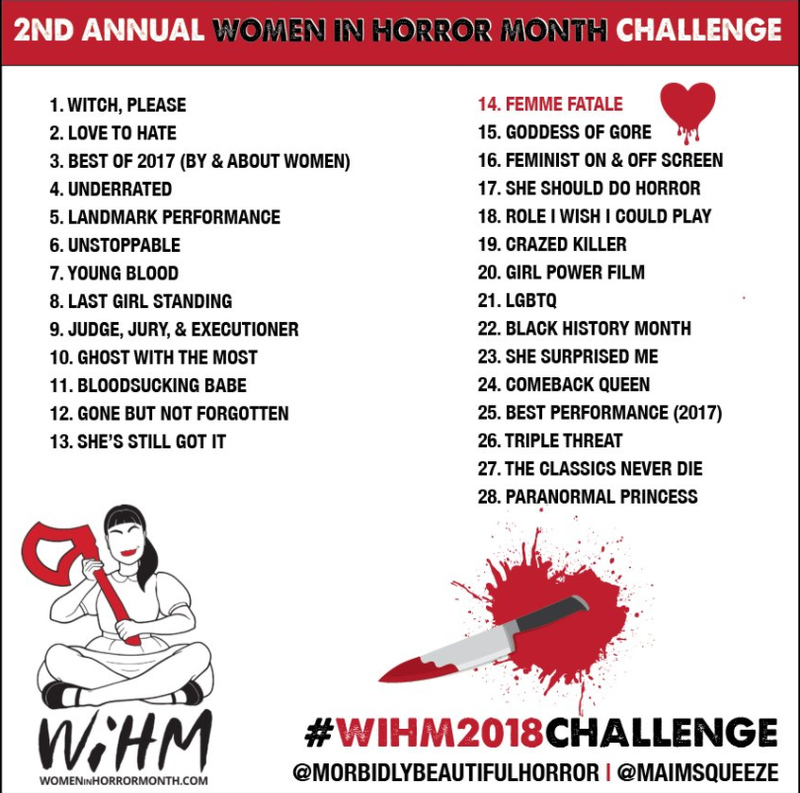 We here at Beyond The Void Horror Podcast joined in on the fun last year to celebrate women in horror. This year is the 2nd Annual Challenge that you too can participate in showing your love of women in the industry by posting your pick for the challenge each day of February. We will be posting on all of our social media our picks this month, we will be theming all of our episodes of the BTV around them, as well as our writers on the website to help out. It's a lot of fun and it helps to show the amazing talent of women in the industry. Our own Mark Doubt kicks off February 1st Challenge with "Witch Please". What is yours? We welcome you to the challenge this month. Anya Taylor Joy in "The Witch"
To kick off Women in Horror Month, I’m going to go for an obvious one – Anya Taylor Joy in Robert Eggers’ The VVitch. A standout performance in a beautifully original film that, like most Witch stories, carries a very potent message about the way women, particularly young women on the verge of discovering their sexuality, are treated in patriarchal society – something that, in many respects, is not much different now to the way it was in the 17th Century. Read on for my review of The VVitch. Robert Eggers’ period (17th Century) folk tale is an original take on the Witch mythos, and one that has proven divisive – almost universally praised by critics, it has become worshipped by some genre fans yet shunned by others. Like a number of recent indie horrors, such as Jennifer Kent’s The Babadook, The Witch carries a subtext about the need to face darkness in ourselves. Whatever the outside forces terrorizing the puritan family, it is their own darkness that is in danger of tearing them apart. Patriarch William, while constantly reminding his clan of their susceptibility to the temptations of Satan, is himself all but consumed with Pride, one of the seven deadly sins. Indeed, it is apparent that William is too puritanical even for puritans, and that his obsession with the sins of his family is what sees him ostracized from society and putting his clan in danger in the first place. Teenage daughter Thomasina is becoming a woman, and though she is the victim of much finger pointing, she is in danger of being seduced by the idea of abandoning her family. Her younger brother Caleb has issues with Lust, and matriarch Katherine battles Despair and Wrath. To the outsider, the family are akin to grotesques, and much of the fear is as inspired by these characters, their traits and relationships to each other as it is to supernatural outside forces. The darkness that lies within these characters is laid bare in The Witch, and is at times the most terrifying force in the movie. That Taylor Joy manages this without risking a lack of empathy from audiences is the young actor’s skill. It is clear that the story centres on Thomasina, and it is difficult not to feel for the girl, who on the surface has done nothing wrong and yet she inspires fear and paranoia in all around her (Thomasina is reaching ‘that’ age – sexual maturity, that thing that provokes fear in parents the world over)...and yet, she may be worthy of her family’s suspicion. William is clearly enslaved by his faith, devoted to the idea that he and his family are sinners and will likely burn in hell – and yet he is a man, doing his best to provide for those closest to him in alien surroundings, and for that he, too, is relatable (if not likeable). Katherine is a woman with no control over her life, and it is this that consumes her, and the younger children know naught but fear. Thomasina manages to manipulate and capitalize upon her family’s emotional misgivings, yet does so in a way that the audience never strays too far from her side. Does she harbour an evil, like her parents suspect? Or is she an innocent, swept up in the emotional maelstrom of her puritan family? This is a question that remains unanswered right up until the closing moments of the film. It is also this ambiguity that will alienate some genre fans – The Witch is not a movie that lays all its cards on the table, not even at its climax. It is a movie with a very deliberate pace, with excruciatingly concentrated plotting constantly teasing its hand but keeping us waiting for the turn of the next card. There is no gore fest, no clear monster (The Witch is shown to us, but sparingly) and while the stakes are high, the period setting and language (taken from genuine texts of the time) does raise a barrier between the film and those who want to crunch popcorn and see the blood splatter and the body parts fly. The Witch harks all the way back to the Val Lewton-produced RKO horror movies of the 1940s – works that are as much melodramas as they are straight genre movies, that aspire to something more than the exploitation casual fans come to the picture houses to see. It is a period film, a morality play and a family drama, drenched in atmosphere and liberally spattered with viscera. It is a film about damnation and salvation, about the terror that is female sexuality, very much framed in a character study (chiefly of Thomasina and William) in much the same way as Lewton and Jacques Tourneur’s Cat People (1942) was a film about the fear of the sexual awakening of its own antagonist, Irena (Simone Simon). The Witch is an incredibly rewarding movie for those that are willing to drink its kool-aid, to tumble down its rabbit hole. It rewards the attentive viewer with shocks, chills and thrills, with moments of stomach-churning gore and no shortage of terror, and a resolution that, while not giving any hard answers, is hauntingly satisfying. It is both a cerebral and an emotional movie, and it accomplishes all this without forsaking the visceral. In its visual style and technique, it is perfection. The harsh New England landscape is photographed to stunning effect by Director Eggers and his Cinematographer Jarin Blaschke – stripped of colour, taking place in what appears to be an eternal dusk, a bleak, inhospitable country with a forest that feels alive with Satanic evil. The score complements the visuals perfectly, beautifully stripped down and used with maximum effect throughout. The lighting, the set design, costumes – all combine to create an exquisite ensemble resonant of the best of period fare, of drama and (yes) of horror have to offer. There is no element of the movie’s production values that does not serve its story and atmosphere well. Despite this, it is the performance of a very talented young actress in the (well-written) role of the central character that sits at the centre of the experience. Possibly the best film of 2015, certainly the best horror film of that year, The Witch is a movie that will reward the patient viewer with an experience that continues long after the film has ended.